Mom stopped to look at some fabric and a guy came up to us to show his hand painted cards. I'd actually been hoping to find him again because I loved his work and the cards make wonderful gifts or unique notes in the mail. He said, "Come sister, just take a look. I give you VERY good price, no?" but started out at 1000F each (about $2). I told him I had been to Togo before and I bought the same ones for 500F last time. He then tried 800F, I replied with 500F. He tried 600F, I held firm. And I got my cards for 500F each. :) I love bargaining! Even if it's a mix of his broken English and my almost non-existent French! 500F is a fair price, he's happy he sold some and I'm happy to support someone who does good work. As I stood there bargaining, Leo was bargaining for Mom's fabric and from what I could understand of their conversation he was explaining that the lady could not charge us like a tourist; that I'd been to Togo before with Mercy Ships and he needed to give us a good price. :) Leo says that after the ship left in August (just a few days after I flew home) Mercy Ships was on TV for about a month--it's nice to be remembered for our service instead of bringing a bunch of tourists! Another young man came up and said, "I remember! You came to my shop with your two friends from Tezas. How are you doing?" Honestly, I barely remember the many young men who helped us bargain, translated for us, and carried our many purchases! A few of us would arrive to the market in a Mercy Ships Land Rover with one Togolese day volunteer to translate for us, but several people would come up and convince us to visit "their shop." I think they probably just represented many stall owners and got a little commission for helping the tourists buy things. :) Anyway, I remembered this guy a little bit and introduced him to my parents. It was a little weird that he remembered me from 8 months ago! Then we went to the Artisan Village just a bit farther down on Rue de Novelle Marche (New Market Street). I'd bought a pair of custom-made sandals, some gifts for my family, and my silver Africa necklace charm here. We had great fun looking at all the little stalls and enjoying the relative peacefulness of this enclosed market. But sorry, fixed prices! Then a quick rest over "Fanta" (orange soda--my favorite brand during my years in Singapore) and "Coca" (the legit full-sugar coke). Next stop was the Universitié de Lome to visit with students at their campus fellowship weekly meeting. Emmanuel was there, and the entire group was led by an English professor who was one of the translators at the conference. Our coming was only planned yesterday, but they still gave us a few moments to introduce ourselves and have dad speak for a bit. He always loves a chance to talk with students and impact the next generation; this time it was all about dreaming big and the difference between "Destination Dreams," "Material Dreams," and "Inspirational Dreams." So, from the Campus Fellowship at Lomé University, Greetings in the name of Jesus! Much of this footage was taken during the field service in Togo. Check out the crew-wide photo (2:40) taken on July 31, 2010, to see a VERY tiny picture of me! Sundays in Africa are wonderful! Pastor Samuel's wife was finally back in Togo and both of them came to pick us up for church. As honored guests we were given front row seats. :) Leo sat next to Dad and translated some of the opening announcements and welcomes. Worship is very loud--think as loud as a concert--and the songs are very simple and repetitive. Some of them were in French, some in English, and some may have been in Ewe (a language spoken in Togo and parts of Ghana and Benin) for all I know. About 15 of the women/young women were dancing in the front of the church and Leo told me to go join them. I was a bit hesitant so he took my arm and pulled me with him into the line of women dancing! :) Ah well, at least with my African dress I sort of fit in! There were probably over a thousand people in the church and as we attempted to turn the car around in the small parking lot (most people take zimis, walk, or have a motorbike) we had to wait for almost 500 children to exit from Sunday School. How they all fit in the building (same one as the Bible school picture from Day 2) I have no idea! Mom commented that the women come dressed in their absolute finest! Beautiful fabrics tailored into gorgeous dresses, decorated tactfully with sparkles, embroidery, or beading. They all look like flowers! Honestly, it makes me sad that in America so many people barely dress up for church; and sometimes the entire church body is wearing t-shirts and everyday jeans and flipflops. Not saying that we should dress up and put on a front for God, but it does show something when most of the African people have very little and still make an effort to show up in clean, pressed, and tasteful clothing. OK, enough of my soapbox! Pastor Samuel was to come pick us up at 3pm. This time, African 3pm really meant 4:15pm! :) Dad had asked to just meet with some of the pastors and get to know them; in Africa if you want people to come you must feed them. So Pastor Samuel arranged a beautiful dinner with 10 key pastors/pastor's wives. Dad started off by sharing a bit about what God's been teaching him, then he asked for them to share about themselves, give feedback on the conference, and ask any questions they may have about leadership or struggles they face in their churches. These pastors lead large churches and have several pastors and small churches under them. About 6:45 we agreed to finally start dinner! First off, Dad cut a beautiful cake they'd made for us! Then, an African salad of "coleslaw", sliced ham, cheese, and corn. We thought we were done and were just waiting for the cake when they brought out fufu! (see previous post for explanation of fufu) I turned to Pastor Samuel and thanked him for finally "taking us for fufu!" He said that although it's a traditional West African meal, they only make fufu when notable people come. We felt very honored and I was glad Mom and Dad could try it! We started early with the last three sessions. The leaders seemed to connect with what Dad was saying and with the material; with almost 250 attendees it's hard to know for sure. Tuesday night a Togolese friend popped up on Facebook chat and wanted to see if we could meet before I left. Emmanuel is a current student at the University of Lome and served as a day volunteer translating for the Mercy Ships crew. He also came with us to Kpalime (see previous post) and served as a valuable resource that weekend! 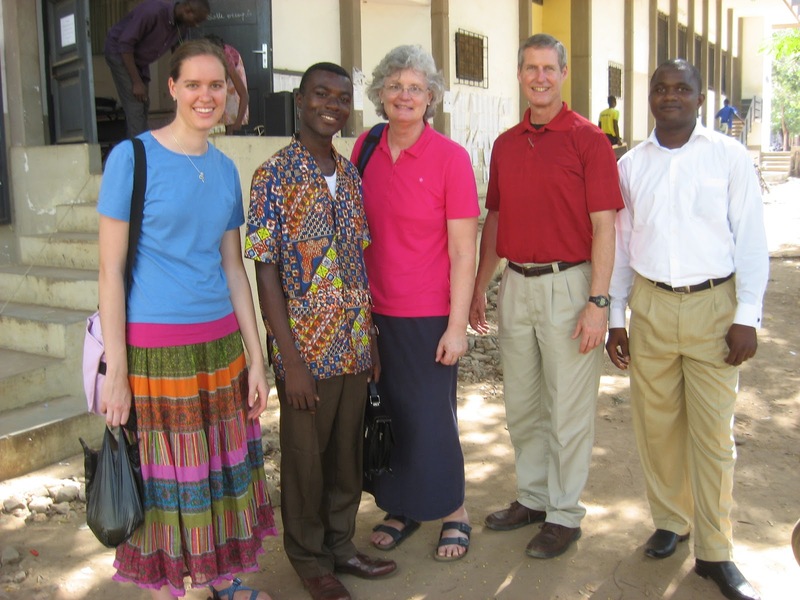 Emmanuel said he would try to come by the church as the conference ended and meet my parents. I wasn't sure he would make it before he left, but I'm glad he did! As I stood by the church's back door waiting for Emmanuel I got into conversation with a few of the young men/women that ran the A/V equipment, sang for the worship team, or manned the book table. They wanted to know about the US, what I was studying in university, and how I liked Togo. One guy asked me what American thought about Togo and they were absolutely shocked when I told them that almost everyone has never even heard of Togo and I have to show my friends where Togo is using my Africa necklace! We had a great time talking for about 20 minutes and they shared with me what they did (some were students, one was a bread maker, one sold produce in the market, and one repaired refrigerators). They wanted to make sure we took a picture together before I left! works part-time as the church secretary... I love her "Queen's English"! Then we came back to the church at 4pm so Mom and I could meet with some of the women leaders from the church and other churches around Lome. We got off to a bit of a slow start, but Leo translated for us and about 30 min into our time the ladies started to ask questions about how to teach the younger women in the church (from Titus 2, Mom's main point), modesty, how to keep girls from "running off with boys", and other issues common to girls around the world! :) Poor Leo, trying to translate for us about modesty. :) But it was a very good time and I hope that we were able to encourage them. Leo drove us back to the hotel and we found ourselves in a traffic jam. After waiting for about 15 minutes and realizing we would soon get completely blocked in, we took a bit of a detour down a road that was still under construction. There were so many cars, zimis, bicycles, and pedestrians on the this road that could not have been more than 20' wide! And although it was only about 7 pm, it was completely pitch black because Lome has no street lights and most of the homes and shops operate by the light of a kerosene flame or a single florescent bulb. Ah... Africa. The conference started at 9am (that is, 9am "African time" which really means about 9:45am) with singing and prayer. There were about 250 pastors from 81 churches all over Lome, from central and northern Togo, and also from Benin (the country directly to the west of Togo). We ended about 1pm when it got rather hot! Life in Togo goes from daybreak to about noon, then 4pm until mid-evening. Pastor Samuel then took us to a lovely restaurant in the heart of the market. We asked to buy some fruit for our evening meal and we left with a large bunch of bananas, mangos, and a jar of roasted peanuts. We woke up Thursday morning for breakfast at the hotel, French style (coffee/tea, pineapple juice, croissants, bread, apricot jam, and an omlette made ham and Swiss cheese). Pastor Samuel was to meet us at 10am for us to go to the local radio station and do a live interview promoting the conference on Friday and Saturday. There’s something about high unemployment and young men with time on their hands and no vision who just create trouble. Protests had been scheduled on Thursday (CNN news) , basically to protest the current law that regulates public protest marches. Ever since the presidential elections in March 2010 that were supposedly rigged, there have been protests every Saturday in Lome, the capital city. The Togolese people have demanded that current president Faure Gnassingbe step down immediately; perhaps following the example of all of the North African countries’ call for government reform. On the street outside the hotel all the traffic suddenly disappeared. The “zimis” (motorbike taxis for one passenger, extremely unsafe, but the only way for people to get around in all of the traffic here), the ladies selling odds and ends from the baskets on their heads, and the shop owners all disappeared. About ten young men set up a pile of used tires in the middle of the street and with the help of a little “petrol” set it on fire. They also lined up stones to block the intersection and set up a makeshift roadblock for the few zimis with passengers bent on getting to their destination. A few minutes later the “gendarmerie” or police followed the plume of black smoke to the scene and proceeded to remove the rocks and separate the burning tires to put out the fire. Only a few minutes after they left the young men ran out to the street and set the tires on fire again. The police returned, put out the fire, fired rubber bullets into the air, and—according to the news reports—fired tear gas canisters. Check out these after-the-fact news reports: AFP News and CNN News. Needless to say, we waited a few hours for everything to clear before Dad and the pastors went to the radio studio! We only had a few minutes to walk on the beach before we had to catch a taxi back to the church to meet with a few of the leaders of Pastor Samuel’s church. We had a chance to ask what their struggles were with leading within the church, how we could help, and what they were doing to grow personally. Then we stopped by a local supermarket to get a few snacks for dinner. We were so tired from the day that we were happy making a meal of pineapple juice, chocolate “biscuits” (cookies), yogurt; using plaintain chips (similar to banana chips) as a spoon. We left Dallas Monday late afternoon and got into Lomé Tuesday night. (I'm 5 hours ahead right of Central Time right now) The hotel here is wonderful--better than I was expecting--and I slept like a rock last night. I'm sorry, economy plane seats just don't cut it! This morning it was breakfast with Samuel, a local pastor and liaison with EQUIP. He took us to his church's compound and recorded an interview with Mom and Dad to air on the radio this afternoon and promote the leadership conference which will be held Friday and Saturday. View out of my hotel room's window. Traffic is usually flooding the streets.